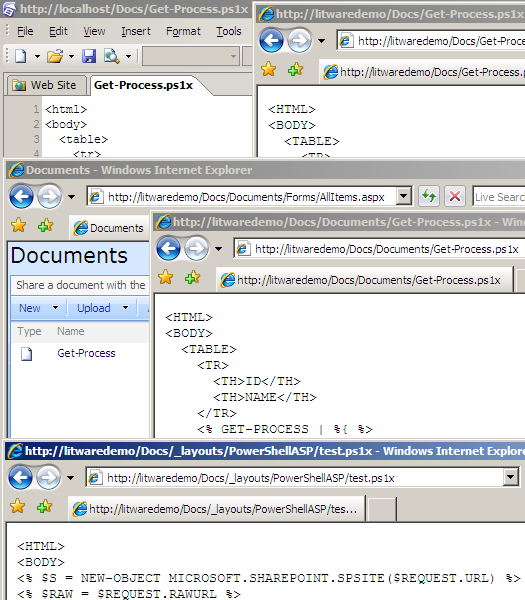 In my last post, I mentioned that PowerShellASP doesn’t work for files stored in a SharePoint content database. It wasn’t hard to track down why this is the case, so my next step was to attempt a fix. Rather than modify the existing handler (much), I propose creating a SharePoint-specific handler that inherits from PSHandler. Before we can do that, we need to refactor the original slightly to facilitate the extension. I haven’t tested extensively, but it’s a start. I doubt the PoShASP team would bother with these changes just for me, so if you’re at all interested leave a comment or at least contact them.